Yolngu Matha is the official name given by linguists for the languages of the Yolngu (Yolŋu), the indigenous people of northeast Arnhem Land in northern Australia. (Yolŋu = people, Matha = tongue, language). It is part of the Pama-Nyungan genus of the Australian family of languages. There are around 8,000 speakers as of 2004 (Australia par 3). 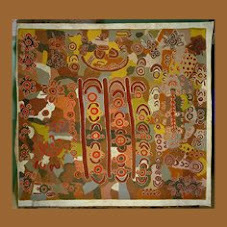 Yolngu Matha comprises about thirty clan varieties and about twelve different dialects, each with its own Yolngu name. Even though there exists a large variation between all these dialects, there is for the most part mutual intelligibility between them, and so most linguists now group these under the Yolngu Matha name. Linguistically, the situation is still quite complicated, for all of the roughly 30 clans speak a named language variety. Most linguists now believe that all the native languages of mainland Australia are related, though as contrasted with the Indo-European languages, for example, the concrete evidence for this hypothesis is not nearly so solid. The languages as a group show little to no affinity with the language families in Southeast Asia or Pacific islands. In some areas of Australia a few of the dialects do show some contact with neighboring peoples, specifically along the Arnhem Land coast. There the Yolngu had well established trade relations with Macassan fisherman for several centuries. There are no written records of any kind surviving from before the advent of European settlement. It is speculated that the Aborigines form a race that is wholly unique and developed over many thousands of years. If that is the case, it would be the merest speculation to suggest that there is any kind of linguistic link to languages outside their native land. As time goes on, archaeologists are establishing earlier and earlier dates for the original Aboriginal settlement and now assert that the first Aborigines settled there even before there was any migration into Indonesia. When Europeans first began arriving on the Australian continent there were about 300,000 native people living there, by most estimates. The number of languages spoken at that time is not certain, but estimates range anywhere from 150 to 650. The problems that arise when attempting to ascertain the number of languages lie in the fact that there is both a lack of exact information attainable from the past and that the people groups themselves have lived in close proximity for centuries. 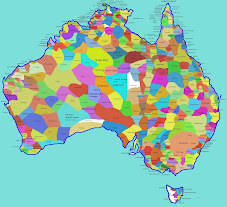 It is still debated as to whether it is dialects or languages under consideration among the native peoples of Australia. A conservative estimate of the languages now, given a very wide qualification for dialect variations to be counted as belonging to a single language, would number at about 250. Of these languages, only about 70 are still spoken by 50 people or more. Only 5 languages have in excess of 1000 speakers. The future for most of these languages is not very secure at this point in time. Many of the native languages are extinct already, with more surely to follow as the older generations die. It is estimated that, due to efforts of state government and other groups such as the Summer Institute of Linguistics (SIL), that about 25 languages have a decently good chance of surviving. Aboriginal languages are now in use in both governmental and private school and pre-schools in many areas of Australia, though there are none where only Aboriginal languages are spoken. There are many bilingual programs installed which aim to preserve the native language while teaching fluency in English, the aim being to give future generations the tools in which to compete in modern-day Australia. A Yolngu Matha language course is taught at Northern Territory University. Michael Christie, and Waymamba Gaykamangu, senior lecturer in Yolngu studies, teach Gupapuyngu, one of the Yolngu dialects. They chose Gupapuyngu because most of the educational materials for Yolngu Matha are in this dialect. The only detailed examination of Yolngu Matha morphology was made by Frances Morphy, and published in "The Handbook of Australian Languages" in 1983. To do this, Morphy looked at Djapu, one of the Yolngu Matha dialects, as a representative example. Djapu has 19 consonants and, like most Australian languages, three vowels. Words must begin with a consonant but can end with either a vowel or a consonant, and stress is primarily on the first syllable. Djapu utilizes verbs, adverbs, demonstratives, personal and interrogative pronouns, and nominals. Nominals are divided into humans and higher animates, and lower animates or inanimates. There are singular, dual and plural number personal pronouns in the first and third person, but in the second person there are only singular and non-singular. Interrogative pronouns and determiners inflect to convey ergative or absolutive case, while personal pronouns are nominative or accusative. Djadaw’marama is a word that literally means to make the sun come up, but its actual meaning is to staying up all night. Yolngu Matha has an SOV word order. It lacks front rounded vowels, glottalized and uvular consonants, and fricatives. 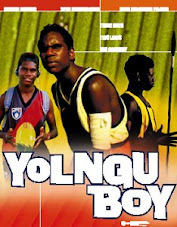 Yolngu languages are suffixing and are isolated from other Pama-Nyungan languages by the Aboriginal peoples of the surrounding areas that speak prefixing languages of other Australian genera. Yolngu Matha exhibits reduplication - the morphological phenomenon of repeating the full or partial root of a word in order to convey grammatical information, like plurality, or to create new words. When this phenomenon occurs frequently throughout the language, linguists call this "productive" usage. Yolngu Matha has dependent-marking in clauses and possessive noun phrases. Grammatically, dependent marking is the mark that shows how different parts of a phrase will be put on the modifiers as opposed to the heads. The head of a phrase is the main noun. The dependents are the adjectives, articles, and possessives. The Yolngu people had trading contact with Macassans from Indonesia for at least 100 years prior to the arrival of the Europeans. In return for the Yolngu allowing them to gather pearls and trepang, the Macassans provided the Yolngu with various goods including knives, canoes, metal, tobacco, and pipes. In the 19th century, the Yolngu came into occasionally violent conflict with the white Australians regarding the Malanga (white people) desire to use the Yolngu land for cattle grazing. A major international incident occurred in 1932 when several Japanese trepangers were killed by Yolngu men after the Japanese allegegly raped some Yolngu women. Donald Thomson, an anthropologist, was sent to investigate, and lived with the Yolngu people for several years. It is through his influence that a special Yolngu military unit was created to repel Japanese invaders on the north coast during World War 2. For the Yolngu people, culture is a manifestation of their ties to the land and the supernatural world that resides there. 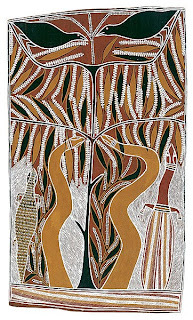 The focus of the spiritual life of the Aboriginal people is “The Dreaming”, a reality beyond the everyday world, a reality that brings moral order to the cosmos. 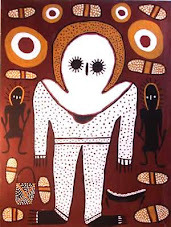 Through stories of supernatural beings and ancestors that lived long ago, the Aboriginal peoples learn how the laws of social and religious behavior came about and, more importantly, how to maintain harmony between humans and the natural universe. 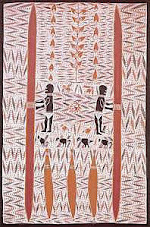 The stories of the Dreaming are sometimes widespread but more often regional and even residing in individual families. Individuals often inherit rights to depict specific Dreaming stories and thereby to communicate the religious meaning of those stories to the world at large. 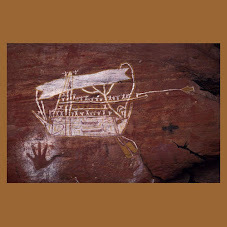 With the subjugation of the Aboriginal peoples by European colonizers beginning in 1788 and the recent rejuvenation of Aboriginal culture and civil rights, there has been a resurgence of pride and interest in the stories of the Dreaming. 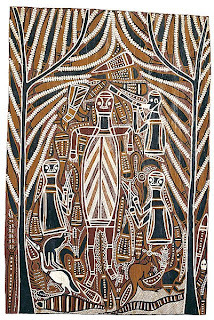 The Yolngu people, in their art, music, and dance have been prominent in this Aboriginal cultural renaissance. In addition to its musical endeavors, Yothu Yindi helped found the Yothu Yindi Foundation, an organization which promotes Yolngu culture and sponsors the annual Garma festival in Arnhem Land, in 1990. 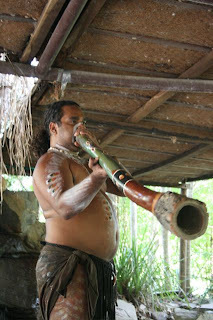 When we think of Aboriginal music, we think of the didgeridoo, which the Yolngu call the yidaki. AUSTRALIA: The challenges of indigenous broadcasting. Small Island Developing States Network. March, 2004. Djapu. The World Atlas of Language Structures Online. Morphy, Frances. "Djapu, a Yolngu dialect." Handbook of Australian Languages, Vol.3. ANU Press, Canberra, 1983. 7. Yurr napurrdja \unhi wiripuny mala \a`apa`mirr ga mar\gin nh^ \ayi \unhi yalu' mayali'. So some of we older people know what this Yalu’ means. 8. Wa\ganydja \ayi yalu' mayali' nhawi warrakangu yalu'. One thing which Yalu’ means is the nest belonging to an animal. 9. Ga bukmak nh^munha' warrakan ga dji`awurrwu yalu' ga wa]'kurraw yalu' balanya malany. And however many animals like scrub fowl and bandicoots have their nests. 10. Warrakangu yalu', ga buluny napurr ga nh^ma yalu' nhakun limurru\galdja rom\ur yol\uwaldja \ayi ga \orra dhuwaliyi yalu' ga yindi y^ku yalu'. That’s the nests belonging to Animals, but also we can see that there is a Yalu’ in our Yolngu law. There is a Yalu’ at work there with important significance. 11. Yalu' mayali' \unhi dhu ga be\ur be\ur marrtji yol\u, ga \unhiwiliw dhu ga \al'yun limurru\gal, \unhi wanhawal yalu'lil dhu ga \al'yun w^\alil, nhakun balanya nhakun warraw' dhuthunu\u dharpa, dhuthunu\u dharpa. The Yalu’ means for a Yolngu who comes from any place or another, they are identified with thus, through whichever Yalu’ belongs to their place, like the shade in the very centre of the tree. 12. Ga \ayi ba]djan mala nhumany dhu balanya nhakun dhuthunu\u dharpa ga ba]dja mala. And the branches, you will be like the branches coming out of the trunk of the tree. 13. Limurrdja wiripuny mala nhakun ba]djan mala dhuwandja limurrdja gandarrpuynha. We people are like all the different branches, we are out in the middle. 14. Ga \ayi worru\uny mala marrtjin limurru\ linygun murrmurryurra (die) yol\u walal dhi\ga\alnha mayali'mirrdja mala dju\unymirrdja (way of life) mala \unhi walal gan nhaltjarr `akara\al dh^wu yalu', yurr napurr walalany \^kul ga m^rra\al \unhi dh^wu. Now our oldest people have all gone on and passed away before us and they died bearing the meaning and bearing the law, and whatever they have been telling us about the Yalu’, we heard and accepted those stories. 15. Ga wiripuydja mala miyalkurruwurryu ga \a`apa`mirriy, yawirriny'thu ga [irramuwurruy, b^y\u walal gan m^rra\al. But also there are some old women and old people, and young men and older men that haven’t received this story. We know what this Yalu’ is, we have heard those old people saying when there was trouble, when there was trouble or something, “Hey, don’t come speaking to us like that or retaliating. 17. Ga \unhi nhe ga walala\ wiripu-gu`kuw \unhi nhe yaka be\ur yarra=a'\ur, ga dhuwandja nhe dhipu\ur napurru\gal yalu'\ur. “You don’t belong to the group of all those other people from their ancestral lines. You are actually here from our own Yalu’. 18. Nhe dhu ga yaka napurru\ balanya buku-ro\anmaram ga \arrtjun napurruny. “You shouldn’t be speaking back to us like that and speaking roughly. 19. Ga mu`kuru `akaram napurruny. Dhuwalin nhe gan \unhi dhu\any \uthar nhe ga napurrunhany \unhi yalu'nany ga moman. And so you have answered back, and said what is this Yalu’ thing? 21. Nhawin limurru\ raki', raki', balanya nhakun dharpa, ga ba]djan mala. It is like a string, a string, like a tree with all its branches. 22. Ga wanha\ur limurr gan \unhi marrtji, ya balanya. From wherever we came like that. 23. Limurr dhu, nhakun napurr dhu guya\a ro\iyirr napurr dhu birrka'yun \unhi wanha\ur napurr, wanha napurru\ family, napurru\guny nhakun family wiripuny mala. We will, we have to remember and think about where we come from, where our family belongs, and also the family that we produce.